Imagine it’s an early evening in June and you’re sitting on the beach watching the sun go down while nursing an umbrella-topped goblet of rum, juice, and tropical fruit. You’re a restaurant owner, but your eatery has been doing well, so now you’re spending more evenings on the beach, and fewer in the kitchen. All of a sudden you receive a text message on your phone. The temperature of the walk-in freezer on the lower level of your restaurant has just risen above a preset critical limit. The message was sent to you by NotifEye, the remote temperature monitoring system introduced by Cooper-Atkins earlier this year. You congratulate yourself for installing NotifEye while you dial your head chef and alert him to the problem. He checks the box and discovers a tripped breaker. He resets the breaker. The freezer returns to safe operating temperatures. You smile knowing that you just prevented the loss of several thousands of dollars worth of frozen inventory. You order another drink. This must be an elaborate, high-tech system for sure, right? No. Not at all. 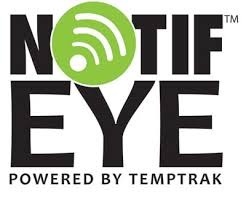 NotifEye is a simple, self-installable system that is ready to use right out of the box. It requires minimal set-up and uses cloud software to communicate with your computer and phone. It can be ordered with either an Ethernet Gateway (on left) or USB Gateway Kit (on right) with four sensors. NotifEye is ideal for remotely monitoring critical temperatures in coolers, freezers, walk-ins, reach-ins, salad bars, steam tables, open merchandisers, and holding cabinets. NotifEye can increase operating efficiencies while avoiding potential spoilage.